Fash Boulevard: Latest Guest Post: What's In My Bag? 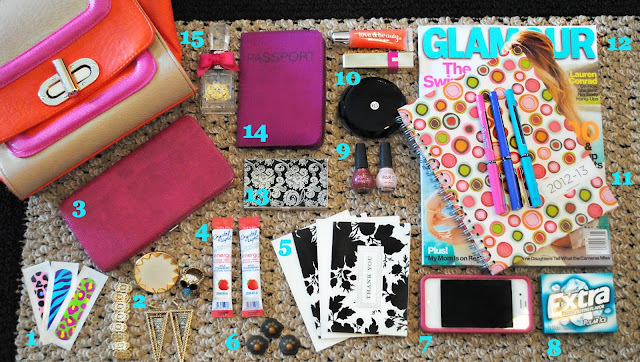 Latest Guest Post: What's In My Bag? Since I'm always traveling back and forth from Los Angeles to the east coast to visit my family, you can usually expect to find a slew of plane tickets and receipts in my purse... I tend to hoard the latter for far too long. But admit it—don’t you? During the colder months, you can typically find me shopping for my handbags in the luggage department, but with summer upon us, I have been trying to migrate toward smaller bags since they are easier for traveling and perfect for spontaneous beach trips. Until our bank accounts allow us to rock a Birkin with our bathing suit, I suggest reaching for clutches or smaller satchels during these warmer months. I recently found this colorful handbag from Frock Candy, which is the perfect go-to summer purse. The box tote flawlessly mixes and matches with my favorite color blocked ensembles, which is always a trendy summer must. Below are the current contents of my handbag. Below are some of the things you'll find in my bag most of the time depending on the size of the bag I'm carrying that week. What's the one thing you always keep in your bag? Bandages. For some reason I’m constantly getting little blisters on my feet while trying to break in a new pair of flats. Give me a pair of heels and I could walk for hours, but hand me a pair of flats and it's time to whip out the first aid kit. These super cute animal print bandages from Forever 21 are my new faves. Flair. I always keep a ziplock bag filled with a few cocktail rings, statement earrings and bracelets/bangles that I can easily slip on for those days that I rush out the door forgetting my essentials. Wallet. I recently switched to a thin flat wallet and find that the limited space keeps me from hoarding things I don’t need. It’s easier to switch purses on a whim and also keeps my purse light. Crystal Light is pretty much my main obsession in life. I always keep a few packets in my purse so I can add them to a bottle of water throughout the day. I don't drink coffee so this strawberry energy flavor is my go-to for a late afternoon pick-me-up. Thank You Notes. Since it’s been only a few weeks since my wedding and I’ve yet to finish sending out all of my thank you cards, I’ve got a few tucked away in my purse so I can finish them in my downtime. There just aren’t enough hours in the day to write down how thankful I truly am. Doggie Treats. Yes, I keep little dog treats tucked in my purse for my puppy, Maddox Dior. I’m an overly obsessed dog mom and proud of it. Phone. I just recently switched from my beloved Blackberry to an iPhone and although I miss the quick typing keypad, I totally can't imagine life without all of these extremely useful apps. Gum. 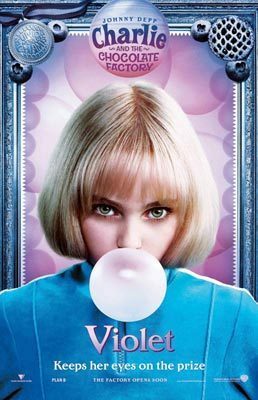 I absolutely love gum, in a Violet Beauregarde sort of way, so of course my purse is always stocked with a pack or two. Polish. Whenever I have freshly manicured nails I try to remember to throw the polish in my purse incase I fall victim to the dreaded chipped polish. A quick touch up will have you feeling perfectly polished in seconds. Makeup. I generally don’t keep a lot of makeup in my purse other than powder and lip-gloss for touch ups. When I’m traveling I put my mini-makeup bag in my purse just incase I experience flight delays or decide to get bumped. It’s never a fun traveling experience when your makeup is trapped on a plane. Planner. Yes, in this world filled with digital documents, I still like to put pen to paper. Call me old fashioned, but my planner is my go-to for all things. Typically you'll find me making shopping lists and scribbling ideas for upcoming blog posts. Magazines are essential. Whether you’re browsing through them on your lunch break or taking a few minutes to peacefully catch up on your celebrity gossip, it’s always good to keep a few of your favorite reads within arm's reach. Card Holder. My mom gave me this business card holder for Christmas and I take it everywhere I go, even though I've yet to make business cards of my own. I was hoping it would remind me to actually print a few, but for now it's just filled with everyone else’s business cards. Passport. I wish I could say I carry around my passport daily because I'm such an avid world traveler, but sadly I lost my driver's license at a party recently and the DMV is taking forever to send me a new one. To be honest, I secretly love it. Almost every time I whip out my passport someone asks, Where are you visiting from? and anytime I can practice my British and Russian accents, I’m happy! Perfume. I always try to keep a small bottle of perfume in my handbag, because there’s something about spritzing yourself in your favorite scent that makes you feel refreshed even after a long day at work. That is a great bag. That's so cute that you keep dog treats in your bag. I have a little girl puppy that adore as well. I'm addicted to gum too. Great post. I always love these posts! Your bag is so cute! Ok is your bag Mary Poppins like? I can't imagine you getting all that stuff in there! I always keep mags in my purse too. Vogue and glamour are my faves. Your passport is adorable. I need one like that... Where's it from? love your bag, everything in it is so colorful!!! You have such a gorgeous bag, and I really enjoyed reading this post, it was so interesting, your posts always inspire me. LMAOF. That passport thing is hilarious. That bag is so cute like a candy. I love the colours of it - so summer-ish! My bags are always too heavy, no matter what size it is...I change the bag every day, sometimes several time a day, but what I always have in them is a pack of handkerchieves, I can't leave the home without them. I love your bag :) So bright and colourful! wow wow! 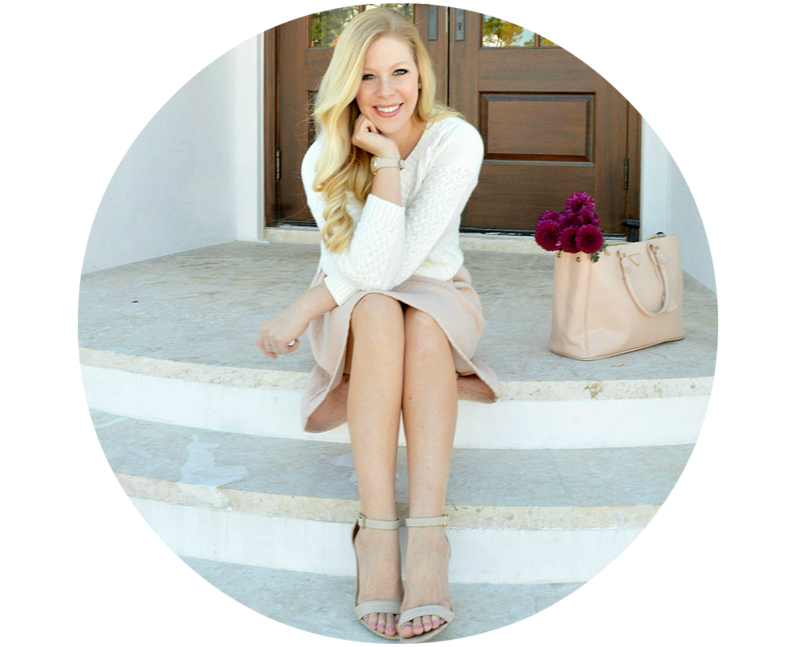 i love your blog and your bag too! I really enjoy reading this post! I'm always excited to know what's inside someone's bag! that bag is calling out to me! I have a pair of shoes that would go with it so well, your bag is soo organised- I wish mine was like this! Great post. Can't believe you can fit so much in that small bag. wow! I'm surprised all those things can fit into your bag! but I'm loving the colours of your bag! Amazing bag, really love the colours. Good idea to keep some rings and earrings in your bag! I always enjoy these posts; I really need to do one myself! that bag is suppppppeeeer amazing!!! Lovely stash you got in your fabulous purse!! I love your passport holder! I need to find a cute one for mine! I adore these type of posts (does that make me a complete weirdo?) because it gives me ideas for organizing my own bags! Oh my gosh that bag is awesome. I love all these Frock Candy items you keep posting. Def. Buying the bag! Great post girlie. Obsessed with your bag. I always make sure to have a magazine in my purse. Typically US weekly. I hope you're having a fab weekend. Anna, I love that purse and your planner. 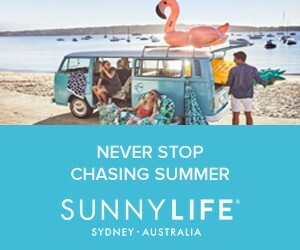 Where's it from? Great post! Love that purse so much! Cute post! I don't why flats always hurt more than heels, I too carry a couple of bandaids, got to be prepared! Such a smart idea about the zip lock bag, I might have to steal that idea. lovely photo!! i love your bag!!!! Love this purse and all the bright colors :) You always rock the bright so well! Your bag is so super cute, love it! What great ideas! I should carry rings in my purse too because it's the one thing you can never have enough of! I'm an obsessed doggy mom so I can relate to the doggy treats, they're always in my purse too! wow where to begin! I love it... where did you get those cute bandaids at? I love the passport & card holder so cute.... & the planner is for sure a must have agreed! Your bag is amazing! While I don't personally carry a bag, I love seeing what people carry in theirs! Great post! What kind of pens are those and where is your planner from? Your bag and its contents are colorful! I love it! I just found your blog and I love it. This post is great, I saw this purse on Lauren Conrad's site and had to come find out where it's from but just saw it's sold out. Boo. I'll keep checking back though. Great blog. Wow! I just keep a pen, hairbrush, handkerchief, wallet, business cards, sunglasses and umbrella in my purse. My weakness is lipstick. I always have four tubes on hand, because I wear different colors depending on my outfit. I carry around a Lilly Pulitzer planner. I absolutely love them and they're compact size but they still have plenty of space to write. I WISH flats hurt me more than heels. I can't wear heels longer than 20 minutes with out the balls of my feet KILLING me :( I wish I could make it stop because they are so darn cute! Your bag is gorgeous! I love it!